Baga, and Anjuna which offer a Good variety of shops, restaurants, bars and array of water sports and also bungee jumping. 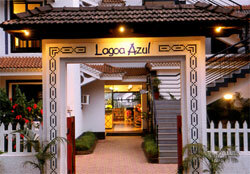 Tabla: The gourmet restaurant overlooks the lagoon serving authentic Goan, Indian, Continental and Chinese culinary delights. Elephant & Castle: Pub with a well stocked bar pool tables, board games and dart boards. Pool Side Bar: Where you can sip a few exotic cocktails. Two swimming pools with adjoing toddlers pool, Room service, Currency exchange, Safe deposit lockers, Laundry, Doctor on call, Children play area, Car parking STD, ISD, Fax, Email services, Chauffer driven car hire, Travel arrangements, Sight seeing. Take a leisurely stroll around our very own lagoon or try your luck angling also make your morning walks more interesting as you bird watch the migratory birds are a delight to watch enjoy a leisurely. Comfort and elegance the resort has 80 well appointed air conditioned standard and suite room - most of them pool facing offering a stunning panoramic view of picturesque landscape consisting of gently swaying palms and paddy fields, Designed keeping in mind an international tourist would expect, it is an ideal holiday destination packed with luxuries of home, all rooms have balconies and are equipped with satellite TV, refrigerator with mini bar telephone and hot/cold water.